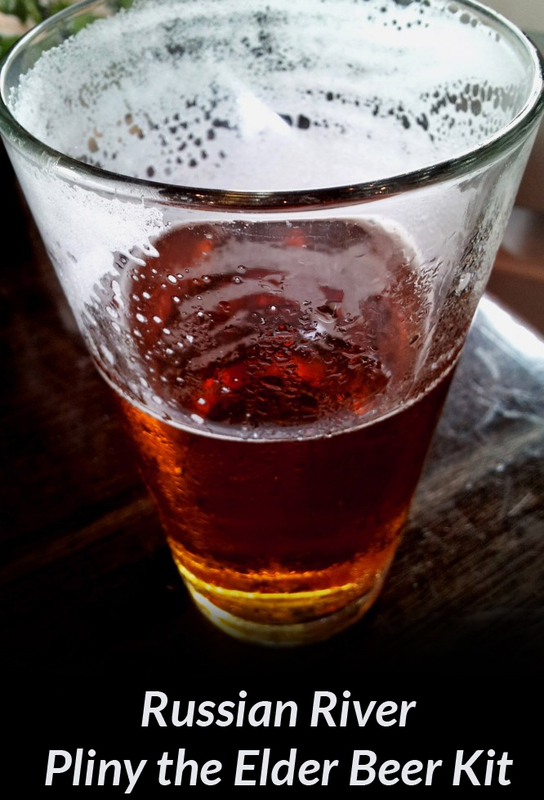 The American Home Brewers Association has released its 2015 Best American Beer results. For the most part it is the usual suspects rounding out the top 10 with out too many real surprises on the list. Pliny the Elder captured the 1st place spot, a nice tribute to a great beer. 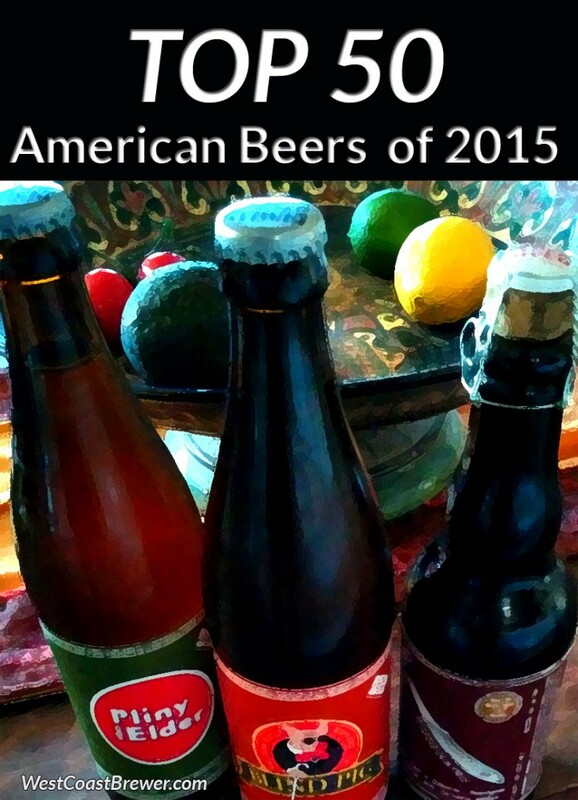 They also ranked the Top Breweries of 2015 and Top Import Beers. Those lists can be viewed at homebrewersassociation.org. 16) Russian River – Blind Pig I.P.A. 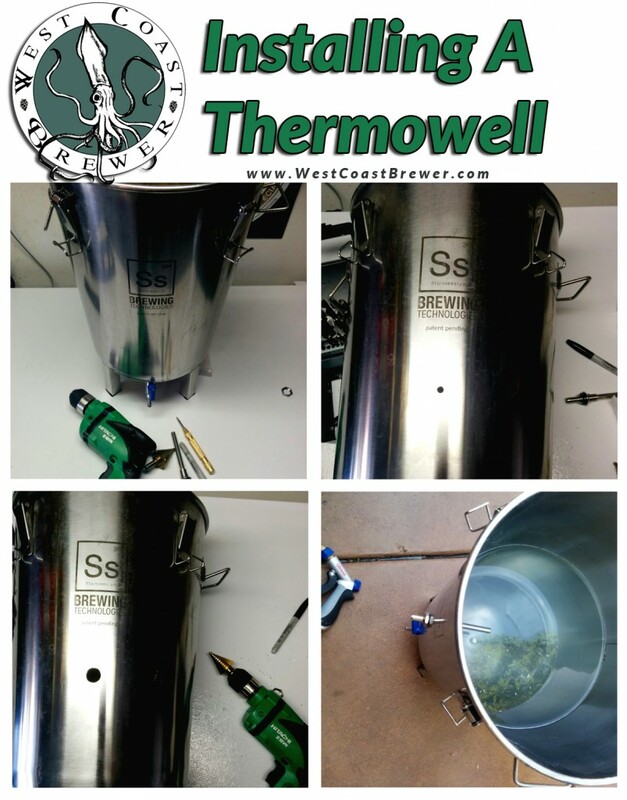 How to install a thermowell in a stainless steel brew kettle or fermentor. I live in Southern California and it is not unusual for me to get daily temperature deviations of more than 30 degrees depending on the time of the day. As you can imagine, this makes regulating fermentation temperatures a bit of a nightmare. So about a year and a half ago I purchased a chest freezer to use as a fermentation chamber. The chest freezer greatly helped in creating a more stable environment for my fermentation but I was taping the temperature probe of my digital thermostat to the side of my carboy or fermentor and that was not giving me a true reading of the actual temperature of the fermenting beer. As beer ferments, especially during times of high yeast activity a good amount of heat is created inside the fermentation vessel which means that the temperature of the beer can differ significantly from the ambient temperature of your fermentation chamber. If the temperature in your fermentation vessel gets to high, your yeast may begin to create off or undesired flavors in your beer. Since the heat produced by yeast activity changes significantly over the course of fermentation, simply compensating by moving the thermostat temperature down a few degrees is not ideal. 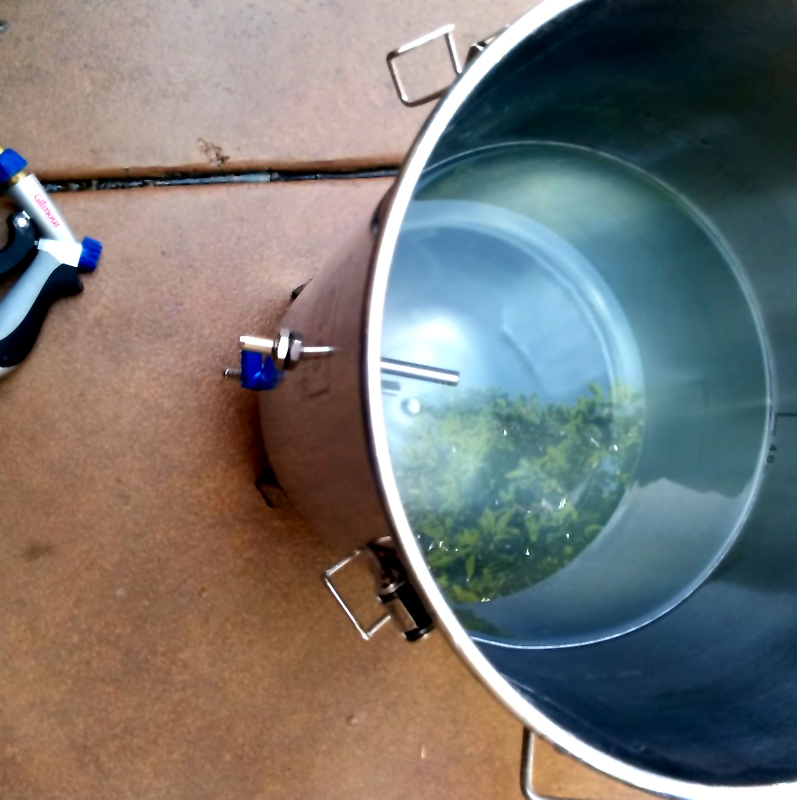 For this reason, many home brewers choose to either purchase a fermentor with a thermowell built in or add a thermowell to their fermentor. A thermowell is a hollow thin walled tube that reaches from the outside wall of the fermentor to a near center point of the inside of the fermentor. The hollow chamber of the thermowell allows you to insert a thermostat temperature probe so that you can get a far more precise reading of the actual temperature inside of the fermentation vessel. 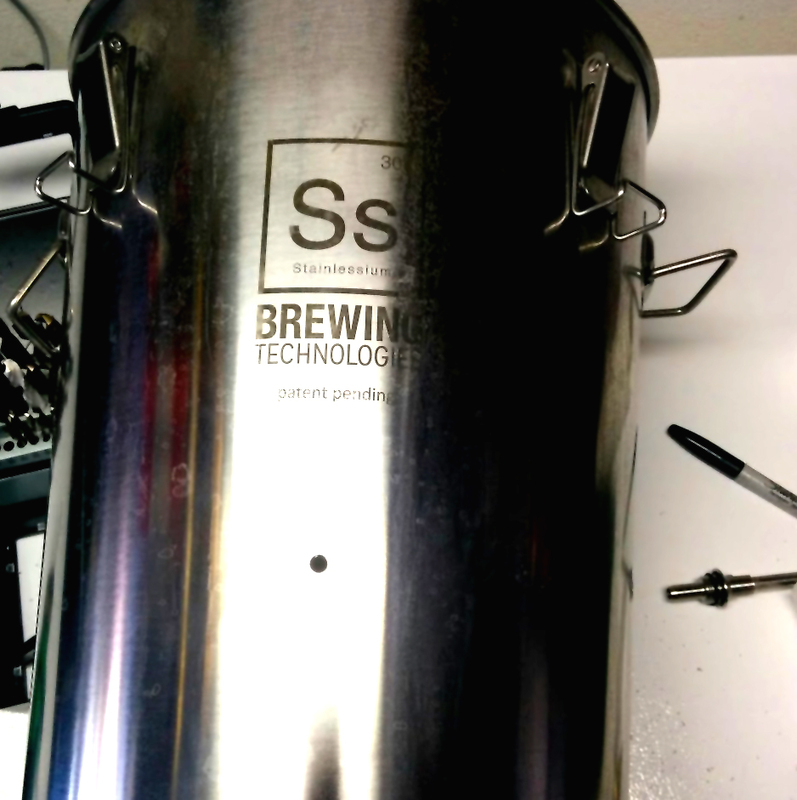 For my fermentation vessel I use a 7 Gallon Stainless Steel Brew Bucket. If is far less expensive than some of the higher end stainless steel fermentors but unfortunately it does not come with a thermowell built in. That being said, it still costs a couple hundred dollars and the last thing that I wanted to do was ruin it by improperly installing a termowell. After doing a little research I was able to install the thermowell with no issues and it only took me about 20 minutes to do. The tools that I used were a center punch, hammer, electric drill, 2 small drill bits, step drill bit, crescent wrench and a little fine grit sand paper. 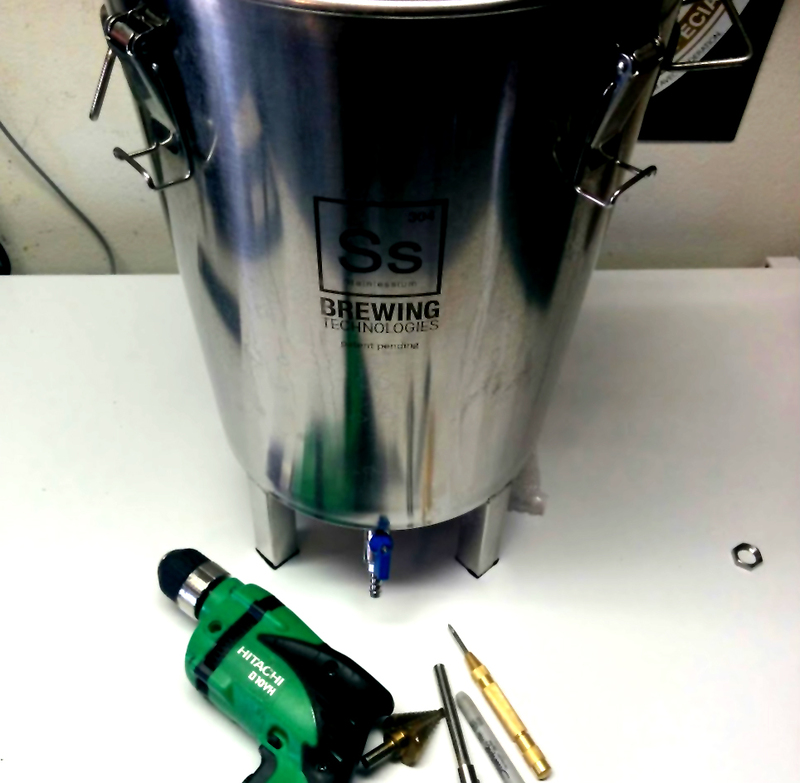 First things first, you will want to gather your tools and mark the point on your fermentor where you want to place your thermowell. 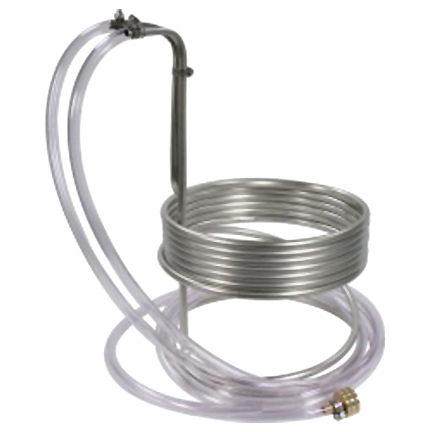 The thermowell should be near the center of the fluid level of your filled fermentor. Also consider that if you prepare different sized batches in your fermentor, you will want to place the thermowell so that it will be able to read the temperature of small batch sizes as well, so it may make sense to place the thermowell a little lower in the fermentation vessel. 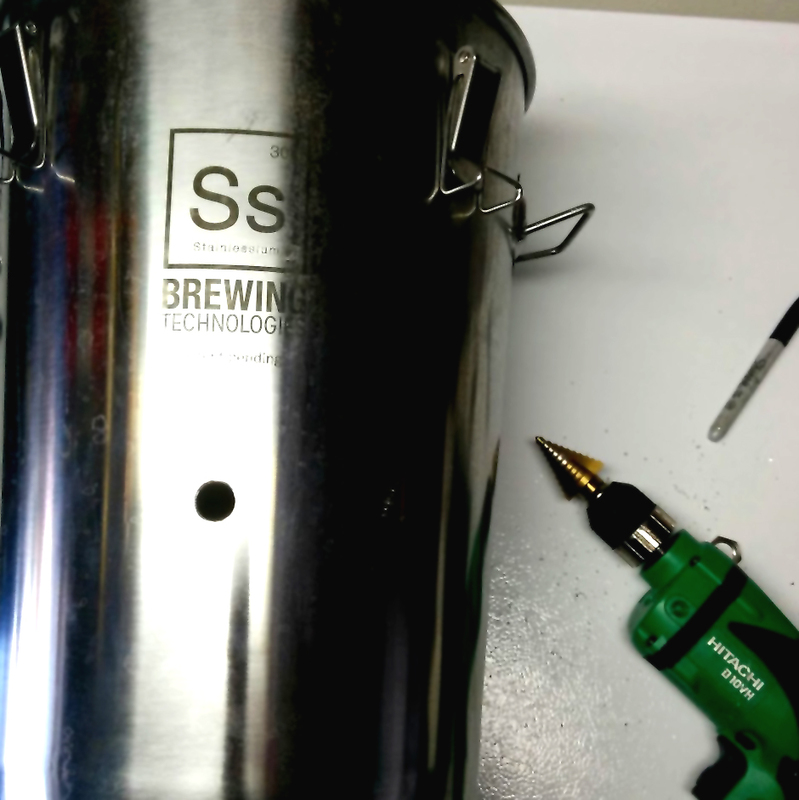 After you mark your installation spot on your fermentor, you will want to use a punch or sharp instrument to make a starting point for when you drill your pilot hole. Next you will want to drill your pilot hole as shown in the image above. In my situation I actually increased the size of the initial pilot hole with a slightly larger drill bit to help accommodate the head of my step drill bit. I then used my step drill bit to increase the diameter of the hole until the thread of my thermowell was able to enter it snugly. Once I verified that it was able to enter, I used the fine grit sand paper to remove any sharp metal and to polish the edges of the drilled hole. Next I mounted the thermowell, making sure to use the included silicone o-ring. Lastly I cleaned the fementor and thermowell and tested it to insure that there were no leaks. The install was a success and I currently have a batch of beer in it and the thermowell is working well as expected! 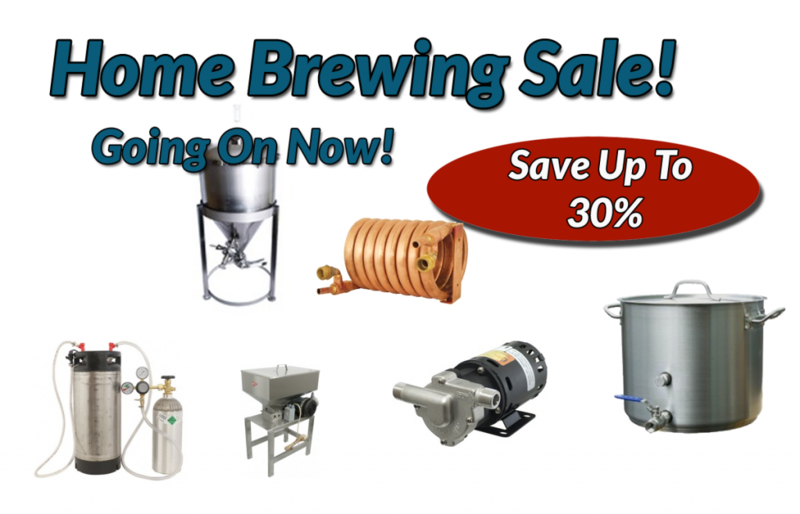 If you are looking to either purchase a fermentor or a thermowell for an existing fermentor, here is where I purchased mine. 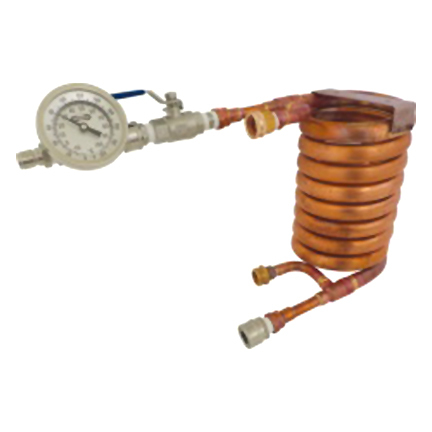 A home brewing wort chiller is a piece of brewing equipment that is important to both all grain home brewers and extract brewers. That being said, different home brewers have different needs when it comes to chilling wort. For instance, one of the main factors to consider before purchasing a wort chiller is batch size! If you are going to opt for an immersion chiller, you are going to want a larger format chiller for a 15 gallon batch size than you are going to want for a 5 gallon batch size. 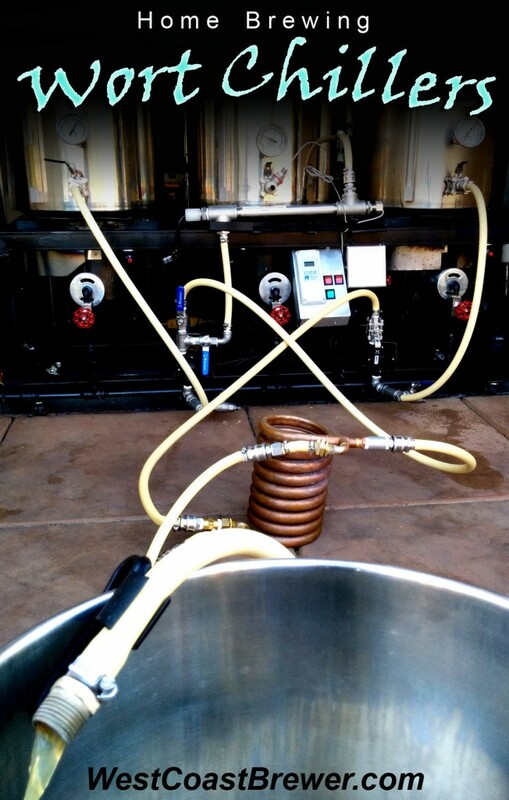 Speed is important when it comes to chilling your wort! The quicker that you can knock down the temperature of your wort from a boil to around 70F and get it into a sanitized fermentor, the better. The more time it takes for you to cool it, the greater the chances of it coming in contact with wild yeast strains or bacteria that would just love to dine on that cooling wort. No pun intended, but the primary qualification of a wort chiller typically BOILS down to how quickly it cools your wort. That being said, there are other things you will want to consider before making a purchase. I have used immersion chillers, plate chillers and counterflow chillers; each had qualities that I liked and and a couple had aspects I disliked. Ultimately the counterflow wort chiller worked out best for my needs because it is compact, fast, easy to clean and fairly clog resistant. They can be used in some gravity fed brewing systems but I would recommend having a pump available to maximize the chillers cooling potential. I will also say this, I have a good friend that has been home brewing for about 20 years now and he swears by his immersion chiller and has a few compelling reasons for not making the switch to a counterflow chiller.